NEW Sony Japan Camera Original Neck Shoulder Strap STP-SS5 Black Condition is New. Shipped with USPS First Class Package (2 to 3 business days). This strap is in NEW unused condition. The unwrapped version is purely for example purposes. EX "Excellent Plus" Exceptionally nice. Will show minimal signs of wear. EX "Excellent" Shows moderate wear. Sony HDR FX1 Strap New 2-178-804-01 Picture is example of stock 8d Sorry but no collections Good Luck Sale Terms and Conditions: Please note that all our products are used and power up unless otherwise stated as being in untested condition. All items are sold as seen in the photos. No other items are included. All products will have cosmetic marks to all surfaces and are supplied as is, with no warranty inferred or implied.If you are not happy with your purchase please return within 14 days of purchase for a full no quibble refund. Purchase of any item from us confirms acceptance of these terms and conditions. Sony Lettering is Embossed on the strap not printed. Sony HDR FX1 Eyecup 2-179-291-01 HDCAM New Picture is example of stock 8d Sorry but no collections Good Luck Sale Terms and Conditions: Please note that all our products are used and power up unless otherwise stated as being in untested condition. All items are sold as seen in the photos. No other items are included. All products will have cosmetic marks to all surfaces and are supplied as is, with no warranty inferred or implied.If you are not happy with your purchase please return within 14 days of purchase for a full no quibble refund. Purchase of any item from us confirms acceptance of these terms and conditions. 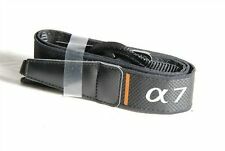 This strap is new and never before used still with original wrap. This item is fully functional. See photos, what you see is what you get. This strap is new and never before used still has original seal. This item is fully functional. See photos, what you see is what you get. 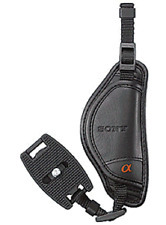 Up for sale is a Sony Handycam OEM Neck or Shoulder strap. It is new never used. 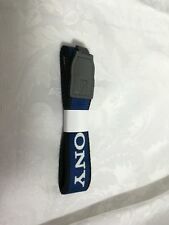 It is navy with black trim and white raised sony letters on it. 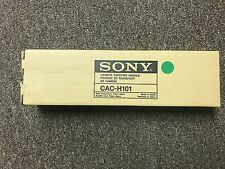 Sony Handy Cam Neck/Shoulder Strap-New in Packaging=L@@K! Here is a great find. Take a look at the pictures and judge this one for yourself. Blue nylon with logo as seen. I will be happy to answer. SONY VCT-GM1 WATERPROOF HEAD MOUNT KIT. GOGGLE MOUNT & HEAD BAND. Condition is New. 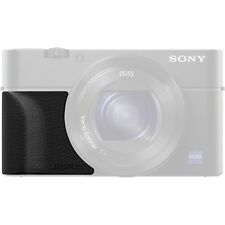 Manufacturer Part Number: STPGB1AM STRG L. THIS IS A GENUINE SONY ITEM from SONY. Although quite a number of manufacturer have adopted the 100-240v (autovolt) power, still a large number of electronics devices may still be mainly 110v. This shoulder strap combined with a carrying case, is the perfect way to tote your Handycam camcorder when you're on the move. WE WILL BE HAPPY TO WORK OUT ANY PROBLEMS/ISSUES RELATING TO YOUR ORDER. SONY STP-FSA WW - Schwimmende Handschlaufe. Condition is New. Shipped with USPS First Class Package. Clip Head Mount and Strap. Strap your Action Cam to your chest and capture stills and video on land, in water, or snow with theSony AKA-CMH1 chest mount harness for Action Cam. Its perfect for a variety of activities such as snorkeling, kayaking, cycling, skiing and more. Style : Battery Grip Bundle. There's even a pop-up electronic viewfinder for eye-level framing and a 180ÃÂ° tilt screen for 18.2MP selfies. Then share photos instantly with built-in Wi-Fi and NFC. Style : Base. Ending Soon. we do not take any responsibilty after this. you can buy in set of 6 max. Monitor & TV. Desktop PC. PC Components. Why Choose Us! Item: Dog Harness AKA-DM1. Allowable waist size 50 cm - 80 cm. Ending Soon. we do not take any responsibilty after this. QUICK LINKS. Desktop PC. PC Components. Monitor & TV. you can buy in set of 6 max. Why Choose Us! 2 - fastening strap which is fastened below the arm. ✔Easy to install: It is bolted to the thread with a bottom plate, and is connected to the strap with a screw-in carabiner. Shoulder strap. Power cable. Accessory shoe cap. Real leather, non-slip grip. Tough and lightweight, the grip also makes it easy to snap. AG-R2 Grip. Easily fits to your RX100, RX100 II, RX100 III, RX100 IV and RX100 V.
This strap is in NEW unused condition. EX "Excellent Plus" Exceptionally nice. Will show minimal signs of wear. EX "Excellent" Shows moderate wear. Possibly light discoloration but no tears or fraying.